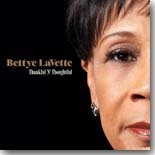 The always wonderful soulful blues singer Bettye Lavette is out with another "must have" CD, Thankful N' Thoughtful. It's this month's Pick Hit. A pair of Houston legends, Milton Hopkins and Jewel Brown, team up for a delightful CD that was an easy choice for this month's Surprise pick. This month's Flashback feature looks at a compilation of some great recordings from Memphis singer Barbara Blue, titled Jus' Blues. Our What's New section features new releases from David Maxwell, Sunny Crownover, Mike Wheeler, Colin Linden, Willie Buck, Eric Bibb and Habib Koite, Teresa James, Al Basile, Mitch Woods and his Rocket 88s, and more.